This holiday season, it suddenly dawned on us: Search engines, like Google, are only trying to be that beloved figure who crosses all the items off someone’s wish list. Any time you enter something into a search box, the system just wants to make you happy and connect you with exactly the result that you’re looking for. The best gift giver around, if you ask us. And because search engines want to maintain that stellar reputation all year round, they care a lot about making quality recommendations when selecting what sites will appear on their SERPs (search engine result pages). Getting your website to make an appearance at a prominent spot, then, will depend on you proving that you have superb content to offer the world, as well as helping these search engines understand when to have you in mind as the best solution they can offer to puzzled searchers. These practices are known as SEO (search engine optimization). 2019 is shaping up to be a big year of advances in this field, as search engines continue getting smarter and more skilled at producing highly specific results that are tailored to exactly what we’re dreaming of. Below, you can find the top 10 SEO trends to get ready for in 2019, to ensure your website is ranking high and getting found by your target audiences. Mobile devices are getting upgraded to first class aboard the Google search plane. In March 2018, the company announced the rollout of something called the mobile-first index. This technical-sounding name simply means that, if you have both a desktop and mobile version of your site, Google’s bots will check out the mobile one first when deciding how to rank your site in the search results. Hence, mobile-first. Get it? (Nice one, Google.) It’s not a mobile-only policy, so if you only have a desktop website, it can still be indexed – the lack of a mobile twin might just mean a lower position on the SERPs. Just wait for it – mobile’s special treatment is far from over. Just a few months after the mobile-first index release, Google also launched the mobile speed update. The translation: Loading speed is a factor in how they calculate the ranking of mobile sites. And remember how mobile sites are now being looked at first by those bots? A lightning fast mobile site, then, is your golden SEO ticket. A first step is taking your desktop site mobile. For Wix users, that step is already checked off (phew!). Any website you create automatically generates a mobile-friendly version, fully optimized for the mobile-first index. Once you’ve designed your desktop site, make sure you duck into the mobile editor with this checklist of mobile website best practices. There are some simple fixes you can make, like hiding unnecessary elements or switching up your image file type from PNG to JPEG, that will improve your mobile site’s loading time. Fashion magazines everywhere aren’t the only ones looking for the ‘next big thing.’ Google is also constantly searching for its new look, as it strives to serve up results in the most convenient format for its users. Lately, it’s been getting really into this format called featured snippets. You’ve definitely seen them (and probably used them, too), even if you didn’t know what they were called at the time. Well, they’re the paragraph excerpt perched above the more classic blue-linked listings on the SERPs, often appearing in response to a question. These featured snippets occupy a spot on the page that’s come to be known as ‘position zero.’ Making it to the first listing is soooo 2018. In 2019, it’s all about coming in 0th place. Sliding right into one of these featured snippets means getting your SEO airtight. 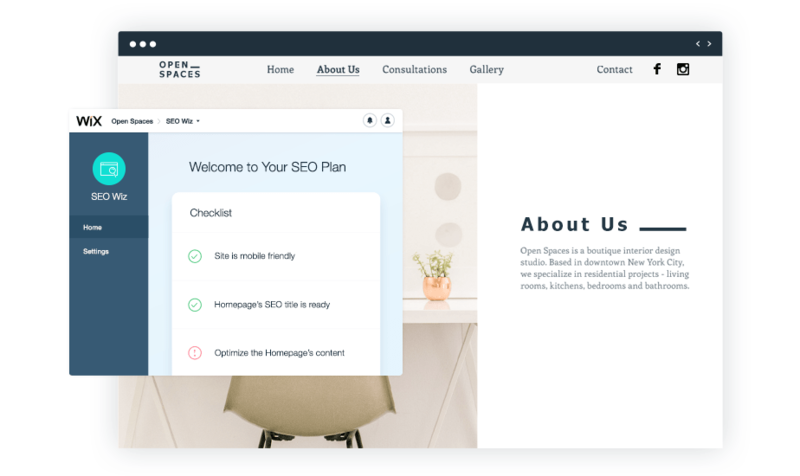 Because 99.58% of pages selected for this spot are already making it onto the first page of listings, help your website get up there, too, with these tips for boosting your website’s SEO. If you’re feeling overwhelmed by the task at hand, meet Wix SEO Wiz, your new best friend for all things optimization. This tool will present you with a handy, personalized checklist for rocking your SEO. Returning to how to make the jump from first page organic listing to featured snippet, let’s think about the function of these prominent boxes, so you can understand how to to structure your content accordingly. Google uses them to answer a user’s question in the fastest way possible, sidestepping the need for a searcher to click on an additional link to get their desired information. The goal, then, is showing Google that your page is a perfect match for that coveted spot. Therefore, pinpoint the knowledge people might be seeking that would lead them to your website (otherwise known as informational search intent). Do you publish recipes? Devise DIY home projects with multi-step directions? Offer financial advising and have started a blogto explain complex tax terms? These are some of the topic areas that do especially well making it to the featured snippets. It’s easy to understand why. You can easily imagine the questions that motivated a user to reach for their nearest Google-equipped device (‘I have to fill out a T-845-whaaat???’). Escalating to featured snippets level will involve going a bit beyond your standard keyword research. Here, your task is to find the exact question words that might introduce a search. For this, you can use a tool like Answer the Public. Once you have your question words down and are clear about what kind of snippet your page is ripe for, you can start formulating your page’s written content to fit. If you’re a financial advising firm, for example, hoping to earn a paragraph snippet about W-9s, make sure your blog post on tax season has a clear 40-60 word description of this form within the body text. That makes it super easy for Google to pull from and place it right where lots of interested users can find that information. Or, if you’re going for a list featured snippet, make each item on the list an H2 or H3 subheader. Known as heading tags, these elements catch Google’s eye more than regular text. For instance, if ‘How do I make pesto sauce?’ is the question you want to compete for, make the answer clear in that stage of the recipe by creating an H2 heading that reads: ‘How to Make Pesto Sauce in 5 Minutes.’ Then follow it with with clearly outlined numbered steps below. Featured snippets aren’t the only feature drawing more eyes to the top of the SERPs. This past June 15, Google switched out the static three-video display for a more wide-ranging video carousel. The new version allows users to keep on scrolling through around eight separate listings. If you weren’t already convinced that video marketing is a must, now you have proof. With more entries able to land a spot in that carousel, and visual material already known to be more engaging than written content, why wouldn’t you want to get in on this opportunity? The process to do so is quite similar to landing your page in the featured snippets from step two. It requires first doing some good keyword research, then formulating those words into likely questions a curious mind might pose to Google’s search box, and, finally, structuring your video’s title and description to reflect what you’ve found out. Hint: ‘How To’ videos have had a lot of success making it on these carousels. Joan Jett might not not care about her bad reputation, but you – as a business owner – certainly should. It’s not even a popularity thing, although of course it’s always nice when people like you. But how the Internet perceives the trustworthiness of your brand can have a tangible impact on Google’s decision to favorably display your page… or not. One common method for demonstrating your reliability as a brand is through something called backlinking. That’s when external sites link to yours, which is like Google speak for ‘voting’ for your site. The more link votes you get, the more legit your web presence seems. But it’s not always easy to get the Internet buzzing with mentions of your brand, especially if your biz is newer on the scene. That’s OK! Why? Because there are some other methods you can use to show Google users you’re the one that they want (oh oh ohh) in 2019. And not only that, a recent SEMrush analysis has shown that backlinking’s influence – while still important – is being surpassed. Taking first place as a ranking factor, is direct website visits. People jump straight to the websites of brands they know to be reliable sources of the information they need. Therefore, it’s crucial to get the name of your company out there and circulating, so it’s the first thought that comes into potential browsers’ minds. The more direct traffic heading your way, the higher up the SERPs you can climb. One way you can bolster your brand image is through ordinary mentions of your name across the Web, even if it’s not accompanied by a link. That means showing up in relevant Facebook forums or discussion posts and mentioning your brand. Another way is maintaining an active social media presence for your business, especially when it comes to customer support. Engage with clients who ask questions on your social channels, and show the world not only that you exist, but that you’re actively involved in your field. Those are all good signs to Google that your brand would make a good recommendation high up in the SERPs. Finally, consider reaching out to social media influencers who you think would rep your brand well. Taken together, these strategies will spin a web of brand mentions across the Internet, sending a clear message to Google that you exist and are well-trusted. In earlier days of the Internet, it was enough to simply churn out content of any sort. Releasing material into the corners of the Web would help bots discover and index your pages, and signal to search engines that your site could be a helpful resource for their users. But the year is 2019, and the Internet has shed its training wheels long ago. Now, in order to be ranking high, it’s not just about quantity anymore. Quality is the new buzzword in the content game. Many SEO experts are speculating that Google’s August 1, 2018 broad core algorithm update has something to do with a more advanced ability to evaluate how much websites are meeting the company’s E-A-T standards. Not to be confused with culinary expectations, this acronym stands for Expertise – Authoritativeness – Trustworthiness. After the August update, as Twitter was flooded with proud web owners wondering how this would impact their SEO, Google’s Search Liaison Danny Sullivan wrote: “Want to do better with a broad change? Have great content.” It’s as simple as that. E-A-Ting up at the competition is about offering your web visitors fascinating blog posts, thorough knowledge bases, and engaging video materials. Find the format that fits your industry, and make it a New Year’s resolution to devote time and energy to delivering new, quality ideas for content on a regular basis. Within this content, remember to offer internal links to other pages on your website. Doing so directs Google bots to more of your material faster than they might have gotten there on their own. It also guides visitors farther into your website, as they start swinging from one link to the next like a little kid on the monkey bars. All of this is good for getting your site noticed, and signaling to Google that people like hanging out at your place. If you’re a Google Chrome user, have you noticed recently how a little message or a lock icon will pop up in the left hand corner of the URL bar? And, super alarmingly, sometimes this corner starts frantically waving a red flag. “Not Secure,” it says. Although, if you ask us, it feels like Google is shouting at us: “Turn back at all costs!” Definitely not a reassuring welcome to a website. These messages are a result of a July 2018 Google security update, whose implementation means non-HTTPS (Hyper Text Transfer Protocol Secure) sites now load with that warning, plus are seen less favorably in Google’s ranking preferences. Overall, this is great news. HTTP websites leave users’ data more vulnerable to being accessed or manipulated by outsiders. As Internet users ourselves, it’s good to know that Google is takings steps to ensure our security online. Especially in light of the passage of the GDPR, all eyes are on online data privacy. The General Data Protection Regulation, which went into full effect in May 2018, is a European Union measure implemented to ramp up data privacy by restricting what companies can do with personal information they hold about their users. While not directly related to the HTTPS showdown takeover, it does point to an overall trend of getting more serious about Internet security, something you can be sure your web visitors have on their minds. This security update can drag your ratings down, though, if you don’t take any measures to bring your website up to this new standard in 2019. For instance, one potential consequence of that ‘Not Secure’ alert is sending guests to hit the ‘Back’ button in search of a more secure website. A high bounce rate (from your page back to the SERPs) does not bode well for your site’s standing. Beyond aesthetics, another factor to be aware of is that the vulnerability of plain ol’ HTTP sites can pave the way for them to be overrun by software that is up to no good. Ultimately, it can create a poor user experience on your page, thereby raising the bounce rate and reducing the amount of time a guest spends browsing your site. That’s why it’s important to keep calm and carry on (tightening your web security). Fortunately for Wix users, making the easy decision to enable HTTPS on your website helps you prevent both of these outcomes, and get in line with this new trend. It sounds like a character straight out of an early video game. And in some ways, that guess is not so far off. Meet RankBrain, the machine-learning AI (artificial intelligence) technology that Google deploys to process and organize its multitudes of search results. The system isn’t new. Launched in 2015, it’s been around for a while. But the factors it’s understood to prioritize are dwell time and CTRs (click-through-rates). And as long as RankBrain is still holding court in Google’s powerful algorithm, then paying attention to increasing both of those factors for your website will always be trendy. Getting more people to click on your site in the first place will depend a lot on writing a superb title tag and description that makes Google’s heart sing. That’s the information that shows up on your listing on the SERPs. You need to make sure the right keywords are there to get it found, and then that your phrasing is enticing enough to get searchers excited about selecting your page as the fairest of them all. Upping your dwell time, A.K.A. how long guests are spending checking out your page, depends a lot on the user experience you offer them. It’s tempting to think something like font size or image arrangement couldn’t possibly be included in the same conversation as AI. Yet, web design affects SEO, and should be taken seriously as a result. You can conveniently use Google Analytics to track your numbers, and measure the impact design tweaks you make might on the average user’s browsing time. Imagine you’re telling a good friend about your favorite band’s concert that you went to see this past weekend. Even though the ‘Beatles’ concert’ (sorry, we’re still stuck in the ‘60s) is technically the subject of your conversation, it would be kind of weird to keep robotically repeating the phrase every time you want to refer to some part of the night. You’d find other ways to say it, for instance ‘the show’ or the ‘Beatles performance.’ We bet other topics would naturally work their way into the conversation, as well. You might mention the crowd, the band, the encore, the sound system, and more. LSI (latent semantic indexing) keywords operate with a very similar logic in mind. Google is so over keyword stuffing, which describes the practice of websites packing their pages with whatever keyword or two they’re hoping to compete for. As you can imagine, this can lead to some not-so-great content, plus it’s not always a reliable indicator that a page will actually meet the searcher’s intent. For example, if someone is browsing for “mouse,” there are so many possibilities about what they could be referring to! A computer accessory? A pet guide? An unpleasant rodent invasion? Now you see how it can get confusing. That’s why LSI keywords are in. Not to be mistaken with synonyms, you can think about them as contextually-related words. Together with your main keywords, they form nice little word families that give Google important context for assessing and organizing your page within its SERPs. As the search engine better understands the context of what you have to say, they can more effectively match a search query with the answer your page has to offer. Like the conversation above about the hypothetical Beatles’ concert (we wish), reaching for related words as you talk about the primary topic at hand is what we already naturally do in everyday conversation or writing. So this is just one more way technological advancements are letting Google more closely mirror the way we already think, talk, and ask questions as humans. Once you have your LSI keyword family in hand, it’s time to distribute them throughout your website. You would put them all the same places you would put your primary keywords: SEO title and description, heading tags, URL, and in the text itself. Remember, these don’t fully replace your main keywords. Rather, they give you alternate ways to phrase your material, giving your page a more natural feel and helping Google understand what you’re all about so they can recommend you to the most suitable searchers. With 30% of web browsing expected to go screenless by 2020, this is a major – and still growing – trend to keep optimizing for (Gartner: 2016). Even though this capability has been making the SEO trends lists for some time now, it’s still relevant as ever. That’s because with technology as recent as this, each year brings new developments, as well as more data we can use to understand how exactly listings are being categorized. Like just this past year, a Backlinko study of 10,000 Google Home results taught us that the system seems to talk up suggestions that are already ranking high on the SERPs, even more so ones that have landed that special 0th place in a featured snippet. We also learned that finding a way to literally write out a question in your content, before moving on to the answer (FAQ page style), seems to perform well on these voice search systems. First, users can get super specific in their queries. Therefore, using long tail keywords (highly descriptive search phrases of at least three words) become more important. Second, they will often spin these long tail keywords into questions when turning to dear friends Alexa, Siri, et al. As we mentioned earlier, using a site like Answer the Public can help you identify likely questions potential customers might be asking. Once you have that information, the second thing you can do is organize your content in ways that prove to search engines that your business is the one with the answers. One good SEO practice for voice searches is slipping those probable questions into the H1, H2 or H3 headers on a FAQ page, or forming blog post titles around them. That same Backlinko study found that excerpts from FAQ pages make an appearance more frequently on voice search results than they do on regular desktop SERPs. There, we said it. There is search territory beyond the famous search engine with the iconic color scheme. (Is this what it felt like to discover the world isn’t flat?) One of the main contenders to pay attention to is Amazon. A Kenshoo survey of consumers showed that 56% usually head straight to Amazon before looking elsewhere. This is an especially significant statistic for eCommerce owners everywhere to take note of. Having a presence on Amazon is a must for making sure your beautiful wares are found. Another platform to pay attention to is YouTube. Yes, we know it’s technically owned by Google. Yet, because more people are heading straight to the video sharing forum before trying their luck on Google’s conventional search page, it’s also critical to think about how to expand your online presence to include this arena. In case you’re not feeling convinced that finding your inner YouTuber is worth it, listen to this: by 2021, online video is expected to account for 80% of all online traffic. You will definitely want to get your brand in on that predicted audience growth. Even though YouTube is its own standalone search entity, Google is also finding ways to merge its listings in with its own. We mentioned above, in trend #3 about video carousels, how the search engine is increasing the number of vids a searcher can scroll through right there on the SERPs. Videos pulled straight from YouTube have a big presence, and will continue to do so. Now, we’re also seeing some of these videos make an appearance in Google Image Search. Plus, there is a video featured snippet, too. Similar to the text-based featured snippets we looked at earlier, the selected videos are aiming to quickly pull answers to users’ questions. That means ‘How-Tos’ and tutorials will make a big splash here. If you’re a small business owner with an online presence, optimizing for Amazon will mean doing some independent keyword research that is specific to the online retailer’s own database. Take a look at how products like yours are listed on the site. You can also turn to a free tool like Sonar for some guidance. Once you have your magic words, you can stick them in your product title and description. Remember to outfit your product pages with stunning images, and to keep track of what customers are saying, frequently responding to questions and concerns (and words of praise!). Another tactic to take is driving traffic to your online store and then seamlessly displaying your Amazon gallery right on site. It’s not so different from the Google SEO thought process. Amazon’s interest is connecting their users with products, and converting browsers into buyers. The clearer and more targeted you make your pages, the higher the chances the eCommerce search engine will suggest your product to a potential customer. When it comes to YouTube SEO, a simple way to get ahead in the game is thinking back to the steps we suggested for getting mentioned in a featured snippet or on a voice search (you know, way back when in steps #2 and #9). Literally writing out a question that is likely to get searched as an FAQ page or blog post header can be a great trigger for Google to produce your content as a result. So what about answering one of those FAQ questions on your page with a video offering a tutorial for a common question your customers have regarding your product? Or swapping out that numbered list of how to make pesto sauce with a video showing you performing all of the steps. Or both?! Whatever you would have previously written as the header text simply becomes the title of your new video, all set to be uploaded to your business YouTube channel. Bam. You’re a video SEO pro. Just one more thing before you’re on your way! Because bots can’t actually “read” your video, they’re looking for any other text you can give them to help them sort out what’s going on. The title and description of the video is a great place to start. The video transcript is another good place. While YouTube does do an auto-transcribe for each video, what emerges, let’s say, does not always sound like the words you spoke. A lot can (literally) get lost in translation. Which means Google also won’t get the message. You can solve this by either adding your own closed captions, or running through the copy generated by YouTube and cleaning it up yourself. Once you’ve created your website and pressed ‘Publish,’ you want to make sure all of that hard work and creative thought gets seen by your target audience! Optimizing your site for search engines is an essential method for making that happen. And by following the action items that accompany each of these ten trends, you can get your website on the cutting edge of SEO in 2019.